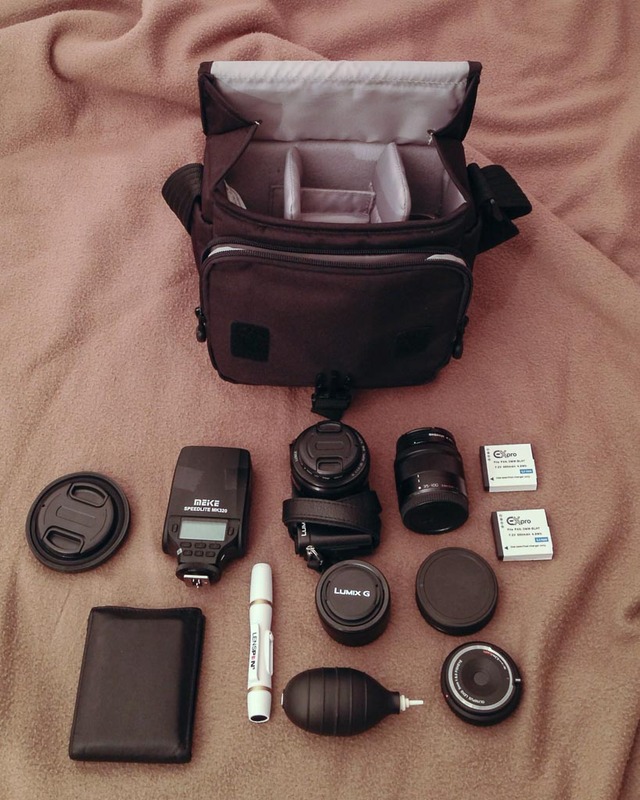 This is a review of the Lowepro Event Messenger 100 camera bag. It’s a nylon, padded, messenger-style camera bag. It’s small and light, with external dimensions (w × d × h) of 22 × 14 × 22 cm or 8.7 × 5.5 × 8.5 in and a weight of 400 g or 14 oz. It comes in two styles: black with red trim and mica (a sort of dirty green) with brown and black trim. It sells for $25 in the US, 40€ in Europe, and £30-£40 in the UK. No one is going to confuse this with an stylish, elegant camera bag, but it does a fine job of carrying and protecting your gear with a minimum of fuss. In my eyes it has one huge advantage: it fits in a standard backpack. So, while I’m schlepping my backback and laptop, while commuting or travelling, my gear is nicely stowed inside. 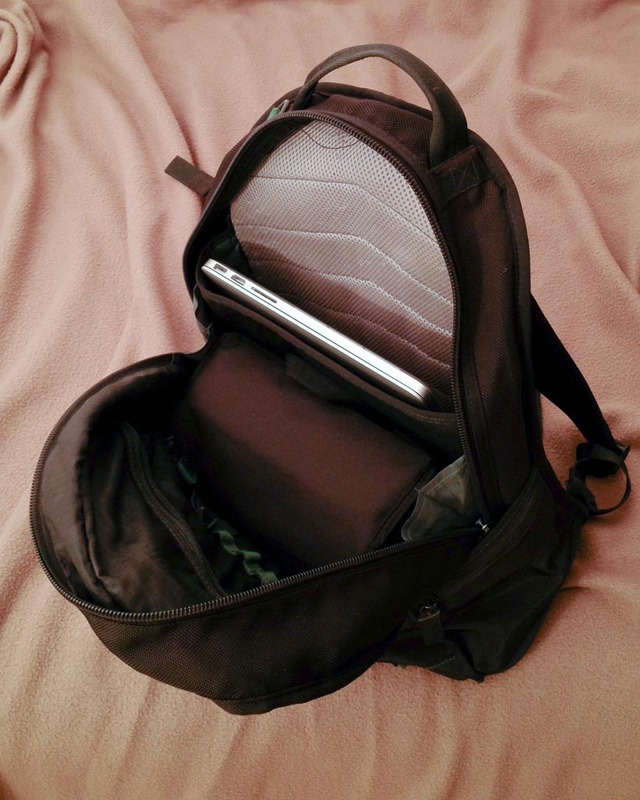 My Lowepro Event Messenger 100 fits snugly into my backpack; that’s its main advantage to me. If that was all I wanted, I’d probably be better off with a backpack-style camera bag. However, this bag-in-bag approach gives me the option of ditching my backpack at my office or hotel and using a smaller and more convenient messenger-style camera bag. If that’s interesting to you too, read on. The padded main compartment section has internal dimensions (w × d × h) of 20 × 9 × 17 cm or 8 x 3.5 x 6.5 in. It has a soft lining and comes with four adjustable, padded dividers, two vertical and two horizontal. 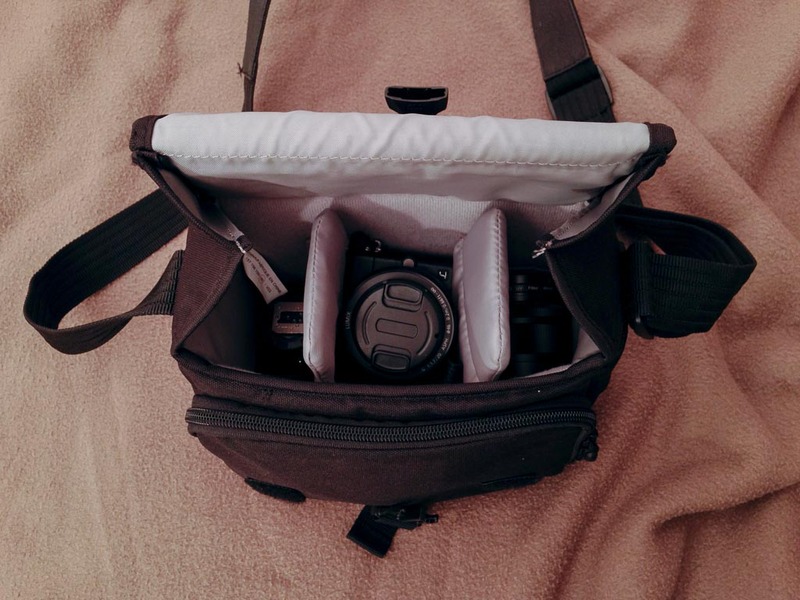 The top 5 cm or 2 in of the vertical dividers are folding flaps, so you can carry a larger body with a lens in a T configuration, lens downwards in the central section and body resting across the top of the bag. A smaller body, like a GM1 or GM5, doesn’t need this. The main flap closes with both a clip and with velcro. You can fold the velcro out of the way, to avoid making noise when you open the flap. The flap has folds over the main compartment for protection, although the bag is not waterproof. The rear pocket is full-width and full-height, but has no fastener. It’s not quite wide enough for an iPad mini, but you could use it for a smaller tablet or a notebook. The front pocket has pouches for a wallet, a pen, and a SD card, and closes with a zipper under the main flap. There are two smaller side pockets. The strap is broad, comfortable, and can be adjusted in length. My Lowepro Event Messenger 100 carries a GM5 body with a 20/1.7 lens, a 12-32/3.5-5.6 lens, a 35-100/4.0-5.6 lens, a Meike 320 flash, a polarizing filter, a collapsable lens hood, a blower, a lens pen, spare batteries, spare SD cards, and a wallet. This is how I organize my bag. I use the vertical dividers to split the main compartment into three roughly-equal width sections. I split the middle section in two with a horizontal divider. I have a Panasonic 12-32/3.5-5.6 in the lower section and a Panasonic GM5 with Panasonic 20/1.7 in the upper section. This section is large enough to carry the GM5 with the 35-100 too, when need be. I also split the right section in two with a horizontal divider. I have a polarizer, a blower, and a Olympus 9/8 fisheye in the lower section and a Panasonic 35-100/4.0-5.6 in the upper section. The 35-100/4.0-5.6 (50 mm long × 56 mm diameter), with a filter and both caps, fits with a finger width to spare both front-to-back and side-to-side, so you could fit a slightly larger lens. However, if you want to carry a much larger lens, you would probably need to configure the dividers differently. I chop and change in the left section. If I’m out during the day, I might use it for my sunglasses and a miniature tripod. If I’m going to an indoor event, I might pack a Meike 320 flash here. Since I have small kids, I use the rear pocket to carry wet-wipes. The zippered front pocket carries my wallet, a lens pen, and a spare SD card. 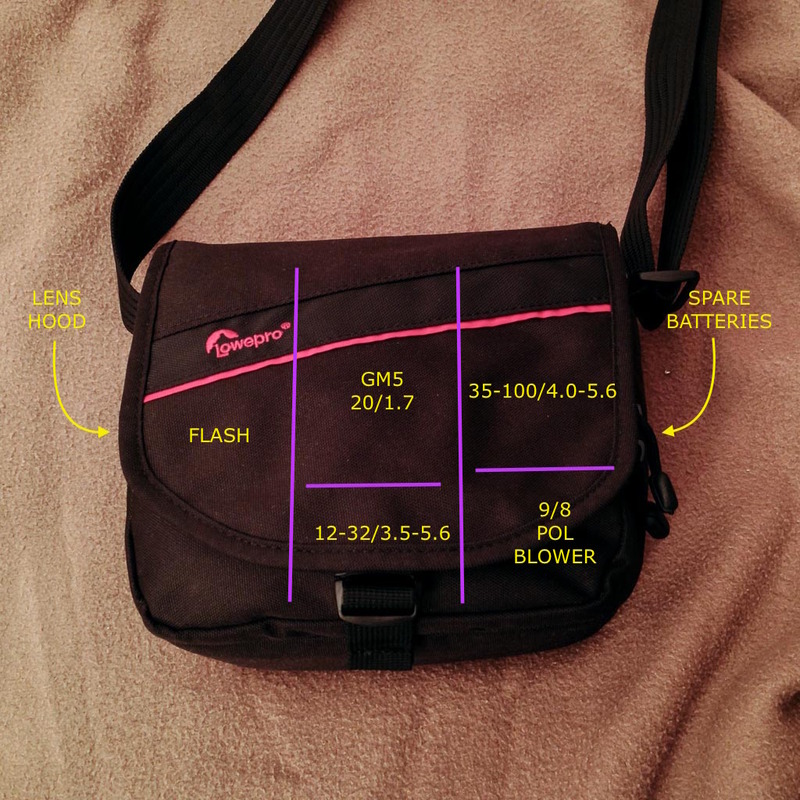 The smaller left and right side pockets carry batteries and a collapsable rubber lens hood with appropriate step-down rings. Even with all of this stuff, I still have a few centimeter of room across the top of the main compartment. The main disadvantages of this bag are, well, it’s squat and ugly and it’s not completely waterproof. On the other hand, in terms of its function as a camera bag, it’s perfectly fine if nothing out of the ordinary. It keeps its contents safe, except in torrential rain, but allows fairly easy access. Job done. It’s a good size for a small body, like a GM1/GM5, GX7/8, G6/G7, OM-D E-M10, or PEN along with several compact lenses. It’s too small, really, for a GH4 and probably a OM-D E-M1, especially as these are likely to be used with the more bulky f/2.8 zooms.